Perfect for the home pastry chef, or anyone else that wants to frost and decorate at home. This set is super easy to use, and is fun for the whole family. You can use it to decorate your "from scratch" creations, or just to improve the look of store bought goodies. Whichever type of pastry you use it on though, you are sure to end up with professional looking results each and every time. These high quality tools require very little skill to use, and make it easy for anyone to decorate like a pro. The pastry gun is perfect for larger decorative shapes, while the smaller squeeze bottles are ideal for lettering, drizzles, and more intricate design work. 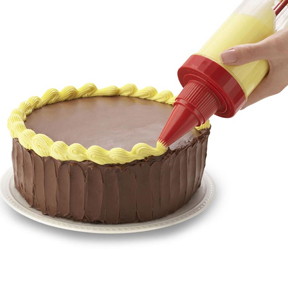 A filling attachment hooks up to the pastry gun so you can easily fill cupcakes, eclairs and cream puffs. Add that creamy center that seems almost impossible to create in one quick and easy step. 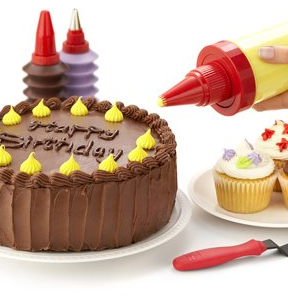 This 20 piece set even comes with a high quality spatula that is flexible so that spreading frosting to a smooth, even finish is a quick and simple task. Make all of the borders, shapes, and effects that you see at the bakery, but do it at home for a fraction of the cost. Jazz up store bought desserts, or put the finishing touches on your own creations. 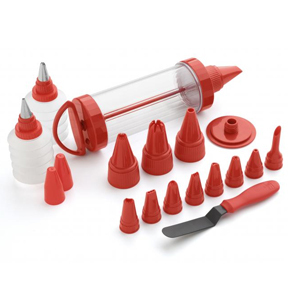 The Kuhn Rikon Pastry Decorating Set includes everything you need to frost and decorate an elaborate birthday, anniversary, or even wedding cake. The pastry gun is super large and holds a ton of frosting. You can fill it once and have enough frosting loaded up to to decorate an entire cake with flowers or two dozen cupcakes with stars and spirals without having to refill it. With just a glance, you can tell how much frosting is left thanks to the clear barrel. Multiple pastry tips in plastic and stainless allow various designs and decorations to be made such as stars, flowers, vines, letters and more. There are 14 tips total that are included. 12 of them are plastic, and the other two are stainless. The combination allows for endless possibilities and ensures you will be able to create anything you can imagine. Two small decorating bottles are also included for precise detailing. Impress your friends and enjoy a house full of great looking, creative sweets. With this set on hand, you will always be ready for any holiday or special occasion that might come up and preparing for birthday parties will be a breeze. 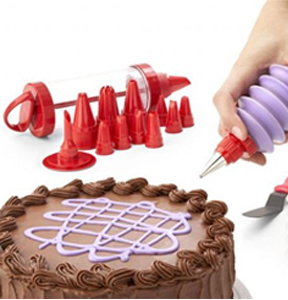 Kuhn Rikon Cake Decorating Set - Give your cakes a professional look. This easy-to-use set gives you all the tools you need to decorate cakes, pastries, cupcakes and more. Achieve great results with very little skill required.